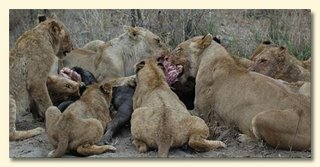 Did lions sit down to dinner to early humans? An interesting paper in PLoS Genetics (my favorite journal nowadays) on an examination of Helicobacter species in humans and lions, that shows that there was a transfer of genetic material from human gut bacteria to lion gut bacteria, indicating that lions more likely ate humans, than the other way around. I am somehat surprised by this, given accounts I've seen or read about current African groups that hunt and kill lions (as a rite of passage, or as a way to get rid of lions that are eating livestock). The time frame that the authors give for this transfer was 50,000 to 400,000 years ago. Helicobacter pylori infection of humans is so old that the population genetic structure of H. pylori reflects ancient human migrations. A closely related species, Helicobacter acinonychis, is specific for large felines, including cheetahs, lions and tigers, whereas hosts more closely related to humans harbor more distantly related Helicobacter species. This observation suggests a jump between host species. But who ate whom and when did it happen? In order to resolve this question, we determined the genomic sequence of H. acinonychis strain Sheeba and compared it to genomes from H. pylori. The conserved core genes between the genomes are so similar that the host jump probably occurred within the last 200,000 (range 50,000-400,000) years. However, the Sheeba genome also possesses unique features that indicate the direction of the host jump, namely from early humans to cats. Sheeba possesses an unusually large number of highly fragmented genes, many encoding outer membrane proteins, which may have been destroyed in order to bypass deleterious responses from the feline host immune system. In addition, the few Sheeba-specific genes that were found include a cluster of genes encoding sialylation of the bacterial cell surface carbohydrates, which were imported by horizontal genetic exchange and might also help to evade host immune defenses. These results provide a genomic basis for elucidating molecular events that allow bacteria to adapt to novel animal hosts. - one from PLoS Genetics on a new method that has detected ancient admixture in Europeans (Neanderthals) and Africans (maybe Paleoafricans, as Dienekes calls them). 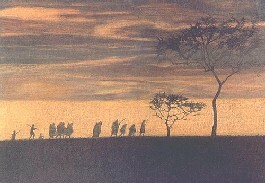 - another in PNAS on the timing of expansion of moderns out of Africa. Back from an internet-free trip, and happy to be blogging again...lots to catch up on, I'm sure.